I know I have seen Othello before, at least a couple of times. But, I never experienced this deliberate, painful story with believable Evil, blinded goodness, and flawed purity. Other Othellos were classic SHAKESPEARE. This was 2018 artistry. 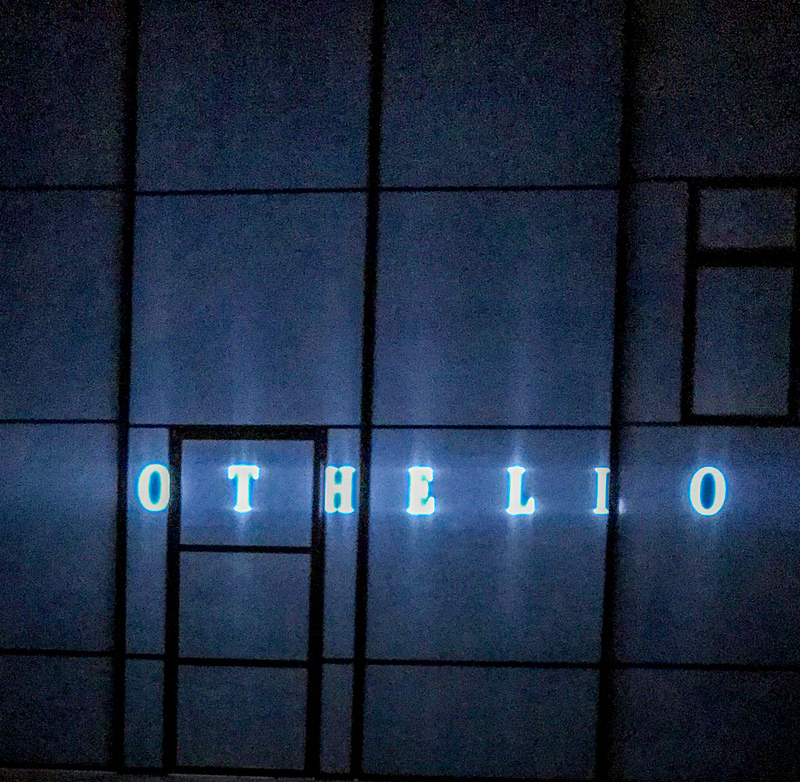 I left the theater wondering if Othello‘s tragedy is personal or is the real sadness that racism, dislike of foreigners, faux-Christian superiority and male dominance has changed so little in 400+ years? Othello (Chris Butler) is certainly flawed and succumbs too completely to Iago’s (Danforth Comins) suggestions of marital infidelity. But, Butler’s Othello is not the bombastic, purely self-important character I’ve been presented with before. He’s trusting, reflective. There are pages of dialog from him and about him I swear were written for this performance. Yes, he makes terrible decisions, but they are recognizable human decisions. 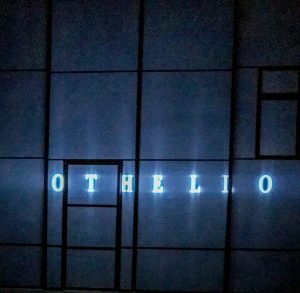 I suspect the nasty racial slurs and the dwelling on Othello’s nationality have been swallowed in other productions to make the play more a great piece of literature focusing on irrational jealousy, suitable for educated audiences. Othello is about misplaced jealously, after all. But, in Director Rauch’s Othello, the prejudiced-based plotting against the Other, exemplified by, but not solely practiced by, Iago deepens the significance of the production. This show is not the easy moral lesson about avoiding gossip and trusting your wife that other Othellos have been. Chris Butler, Alejandra Escalante. Photo by Jenny Graham. There are so many comments about race and nationality. How could I have missed their importance before? I mean, they were there, but it was all about misplaced jealously, wasn’t it? Furthermore, Rauch and his cast have discovered that none of the characters are true stereotypes of good, mindless evil, and blind protectiveness. I don’t remember hearing the subtitles of personality in other productions, but Rauch’s actors emphasize nuance over comfortable classifications. Iago shares his cunning schemes not as an irrational one-dimensional crazy person, but as a hurt, vindictive, effective narrow human. Comins gives us a man, not just an archetype, to despise. Amy Kim Waschke (Emilia) Danforth Comins (Iago). Photo by Jenny Graham. Audiences for all Othellos must lament Desdemona’s panicked concealment of the symbolic handkerchief’s innocent loss. Yet, I’ve never felt before how reasonable Othello was in his doubts about Desdemona’s purity as I did watching OSF’s scene of repeated questions and dissembling. My God! Othello was not the insanely jealous icon of self-delusion and self-righteousness who I remember. I’m sure the dismissive xenophobia of the local population, especially the Muslims, has been there before. But, I just haven’t seen it. At least not in a way that made it part of the central weaving of prejudice and unfairness that poisoned Othello’s mission, marriage, and mind. I especially appreciated a small silent scene, possibly added by Rauch, where the local Muslim official (Barzin Akhavan) unrolls a prayer mat downstage and bows his religious obligations. The dialogue and force of action is about preparation for a public dinner by our Christian characters, but we get to see this quiet act of differentness. Brilliant. This is no pageant grandly presented in the Elizabethan theater. The simple, but exquisite, set by Christopher Acebo allows Iago to come out and literally touch audience members, to draw us in to his need for to recover from the ego injury of having been passed over for promotion by the dark-skinned Othello. I felt his need to bring down the foreigner and to make Venice great again. Othello is placed in modern times, almost flawlessly. The location unleashes Acebo. His clean stages always allow the audience to see the action on stage better, and in Othello he has devised ways to make us feel very comfortable and included in the story. My favorite setting was that of the work-out gym that is used for the serial plotting of the women and the men. You know those series of conversations where people keep meeting each other on the street, saying their lines that move the story, and then disappearing in a rapid succession of “Adieus”? To avoid the street mish-marsh, Acebo created a gym, complete with a wall of big-screen TV’s, where Othello et al naturally came in, worked out, talked, and then moved on to the showers. That’s how people would meet and gossip in 2018! Chris Butler, Derek Garza, James Ryen, Barzin Akhavan. Photo by Jenny Graham. The entire cast was excellent. I am particularly fond of people who make small roles memorable without drawing too much attention to their minor part, and so kudos to Richard Elmore for his whistling handyman. (He’s the Duke, too, but much more fun with his box of tools.) I feel the need to applaud Desdemona (Alejandra Escalante), Cassio (Derek Garza), Roderigo (Stephen Michael Spencer), Emilia (Amy Kim Waschke). and Lodovico (James Ryen) — great jobs! There are two areas which left me flat. First, Othello has an accent that is difficult to understand. Butler delivers it consistently, and I get that it makes him more foreign. But, the accent sounds more like central or south African to me, although I am no expert. In any event, even if it is genuine Moroccan, its distracting. A minor nit. The other nit is some of the costume designs by Dede M. Ayite. For an elegant dinner Desdemona’s dress is a green thing that looked like it came from someone going to my high school prom in 1967. My theater date complained about Desdemona’s orange pants in another scene. Meanwhile Roderigo is given prominent bulging, pointed crotches for no apparent reason. Maybe he has a problem fitting into the wardrobe, but whatever the cause, the effect is distracting. Nothing is ever made of his endowment so I felt like they showed us a gun in Act I but never fired it. Either the costumes — or Roderigo — need some surgery. 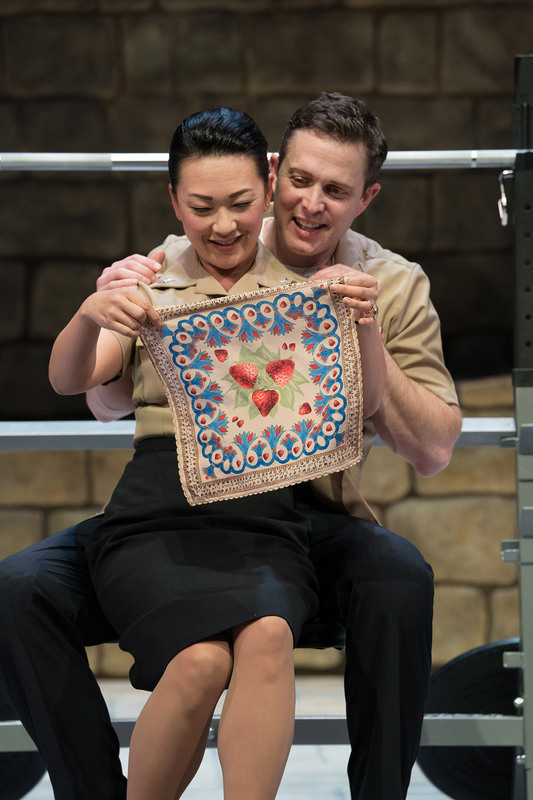 Nits aside, Bill Rauch’s Othello is a masterful performance that exemplifies the uniqueness of the talent and vision of the artists at the Oregon Shakespeare Festival. He and his team avoid the simple, single-themed popular approach to Shakespeare’s story. They restore the many detailed narratives and human depths so that Othello is a modern horror. 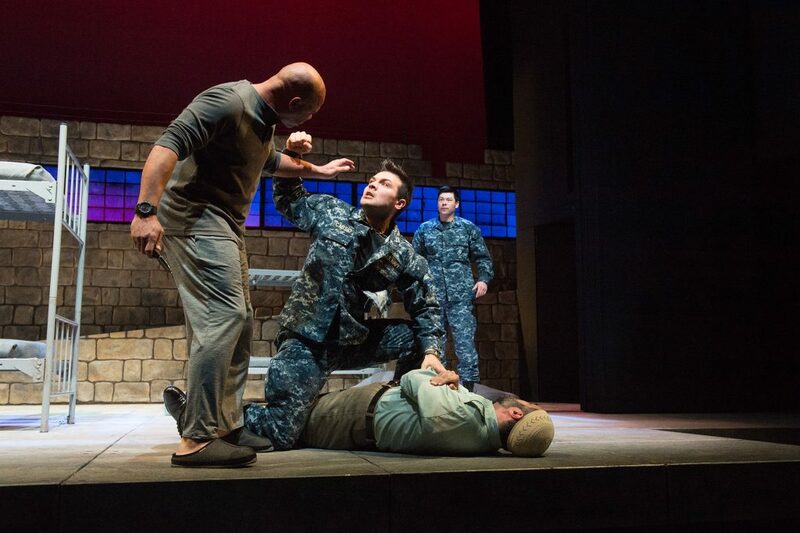 This entry was posted in osf, plays and tagged #OthelloOSF, 5 stars, Islam, Muslim, OSF, Othello, plays, racism, sexism, theater. Bookmark the permalink.